Update (10th September 3:10 BST): Updated with additional comment from bitcoin community. Apple has unveiled Apple Pay, a new mobile payments tool that could significantly impact the way consumers transact both in-person and digitally. The new service was outlined as part of a broader demonstration of the iPhone 6 and iPhone 6 Plus, both of which were introduced at Apple’s event in Cupertino, California, on 9th September. Apple Pay is integrated with existing infrastructure, including Secure Element and Touch ID, while the iPhone 6 introduces near-field communication (NFC) functionality, enabling tap-and-go payments for users of the device. Additionally, Apple has partnered with a cluster of well-known businesses to deploy the infrastructure for the payments feature, which includes McDonald’s, Whole Foods and Disney. When launched, Apple Pay will build a bridge between the company’s consumer technology and the traditional payments network. VISA, American Express and MasterCard, the world’s biggest credit card service providers, have signed up, and the ‘Big Six’ American – Citi, Bank of America, Capital One, Wells Fargo, Chase and Barclays, among others – are also onboard. As CEO Cook explained, Apple is seeking to invigorate what is essentially decades-old technology through the use of Apple Pay. The inner workings of Apple Pay represent a departure from most mobile wallets and payment services. The card numbers are not shared with the merchant, nor does Apple keep track of the numbers of user transactions. If the phone is lost, Apple Pay functionality can be suspended using the Find My iPhone service. Since the phone does not contain credit card data, there is no need to cancel credit cards in case of loss. To make this possible, the service relies on a one-time payment number and a dynamic security code, but there is still not a lot of information on either. Still, this seems to confirm reports of tokenization in Apple Pay. As Bank Innovation points out, Apple is using tokenization and NFC to modernize an old infrastructure and open up new long-term possibilities. However, the question remains: What impact will the announcement have on bitcoin and digital currency? Apple’s presentation didn’t contain any new information related to bitcoin, a subject the company has been silent on since it lifted its ban on bitcoin apps in June. However, Apple CEO Tim Cook noted during his presentation that the developer API for Apple Pay would be released, an announcement that presents a potential avenue for developers to create bitcoin-centric apps using the tool. Although the gadget-centric tech press likes to focus on physical products, Apple’s new mobile payments service is just as interesting, albeit from a different angle. What sets Apple Pay apart from the competition is the scale and comprehensiveness of Apple’s operation. The Apple event drew broad interest from around the technology industry, as well as fans of the Cupertino-based company’s products and services. The iPhone 6 launch also proved to be a popular event, even temporarily overloading the event’s official livestream. Members of the bitcoin community weighed in on the developments on Twitter, contributing responses that ranged from the humorous to the critical. In some cases, commentators compared Apple Pay unfavorably to bitcoin. Pay privacy: only merchant and your bank know who you are. Bitcoin: there is no bank and merchant only sees money, not your personal data. Andreas Antonopoulos, bitcoin entrepreneur and lecturer, commented on Twitter that Apple’s NFC push will put that technology in the hands of more users. Yet in the end, bitcoin will be the better option. 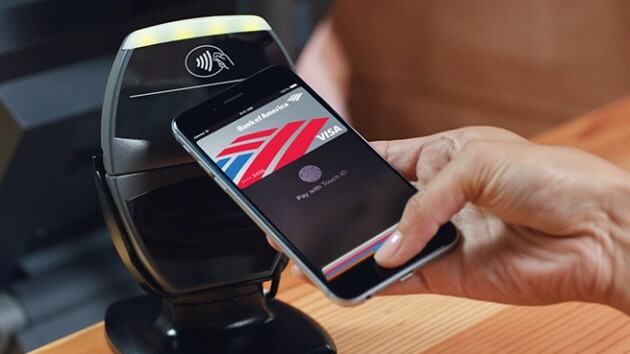 Apple will make NFC available everywhere. Bitcoin will make NFC usable without selling your soul to banks. Reactions from the bitcoin business community followed a similar tract. Coinsetter CEO Jaron Lukasiewicz said that Apple’s move is good for next-generation payments, as it will bring attention to issues common to traditional payments. Jeremy Allaire, CEO of Circle, further asserted that Apple Pay won’t be able to compete with bitcoin long term, citing issues with legacy payment structures. Others in the bitcoin community were quick to seize on this line of thinking, pointing out the mainstream services that now support both Apple Pay and bitcoin. Noted bitcoin investor Barry Silbert tweeted his observation that online commerce giant Stripe will support both methods of payment, which could spur new development opportunities for bitcoin. Similarly, mobile payments platform provider Braintree, which yesterday announced it would soon enable bitcoin payments through a partnership with Coinbase, was quick to inform its community about potential support for Apple Pay. Allaire ended his statements to CoinDesk by suggesting Apple Pay would pave the way for new opportunities for bitcoin developers due to its inclusion of NFC support for iOS devices. Additional reporting provided by Pete Rizzo and Stan Higgins.